This past Christmas I asked for Project Life and thats what I received, a boat load of supplies! This seasoned paper crafter has avoided the Project Life train for far too long! I didn’t want to change my ways because I love, love, love to cut and paste. But when reality set in, I realized I actually only scrapbook about once every other month! It takes me about an hour to make one layout, and keeping up to it just isn’t happening. Project Life to the memory keeping rescue! Not sure what Project Life is? 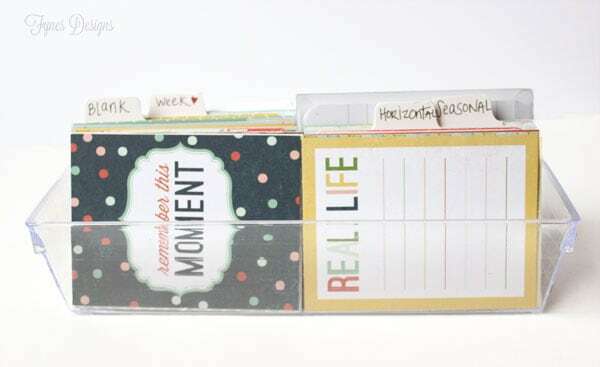 Its a new age scrapbook where you can easily document your daily life with pocket pages. Rather than making a big spread you just insert your photos into pockets along with some journaling cards and a few pretties. For the full scoop check out the details from creator Becky Higgins. When I start something new I have to start out organized. I came across an awesome series from My Sister’s Suitcase that is the perfect place to start, you have to read their tips if you’re thinking PL! With my hoard of new supplies, my brain immediately went to how I was going to store all my goodies? I have a giant craft room, so space wasn’t exactly the issue. What I needed was a practical solution for storing the tidbits, and something I could pick up and take along, since most of my scrapbooking is done at crops away from my desk. 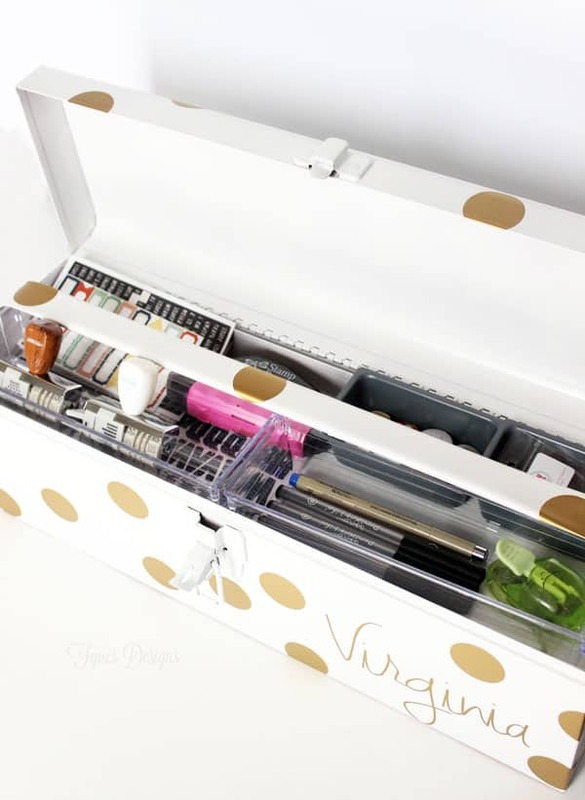 When I was out shopping the boxing day sales I came across this lovely little tool box, for only $2.99, and I knew I had found the perfect project life organization for on the go! The tool box was in really good condition, (with the exception of scratches) so I just had to wipe it down, and sand a few rust spots from the inside. 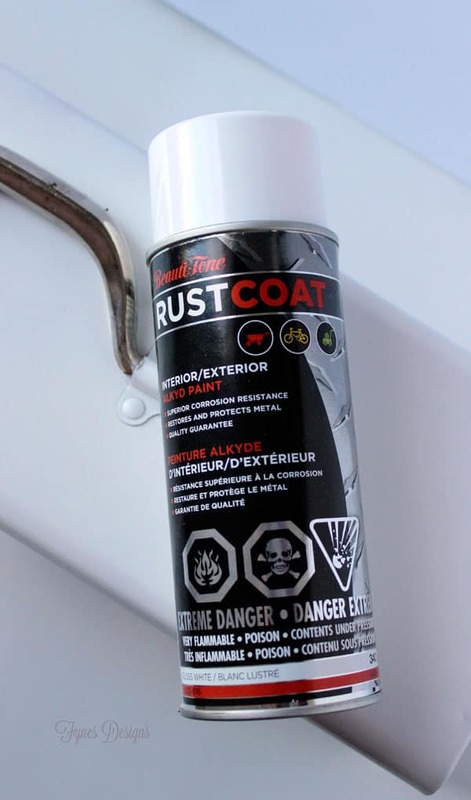 I used Beauti-tone Rust Coat from Home Hardware, this spray paint is literally half the price of other brands and has really great coverage! I was so happy with my results, but it still needed a little something extra. I have a bit of a gold fetish these days, so I cut a sheet of gold polka dots and my name from gold vinyl, stuck them on, then it was absolutely perfect! I had considered painting the dots, but this way I can peel and replace if I tired of the gold or pattern. For the inside, I thought through loads of possibilities of how I would separate my goods, even building little wooden dividers… then I came across these plastic drawer dividers at the dollar store that fit like a glove! The top shelf is a touch more narrow than the bottom, but the two tiny baking pans fit so well that I wasn’t bothered at all! I know it doesn’t hold hoards of supplies but for on the road I think it will do quite nicely! The essentials are all I need! The big plus to this project life organization solution is that it has been sitting on a shelf in my kitchen (so I can do a little PL when I have a spare second) and it hasn’t became an eyesore yet (I’m sure Mr. Fynes loves it there)! This Project Life Organization baby will be making its first road trip in March, I’ll be at Crop and Create Moncton, I’d love to see you there! I have a few little tricks up my sleeve you don’t want to miss! Do you have any great Project Life organization secretes you’d like to share? Or even some tips for this newbie, I’d love to hear them! 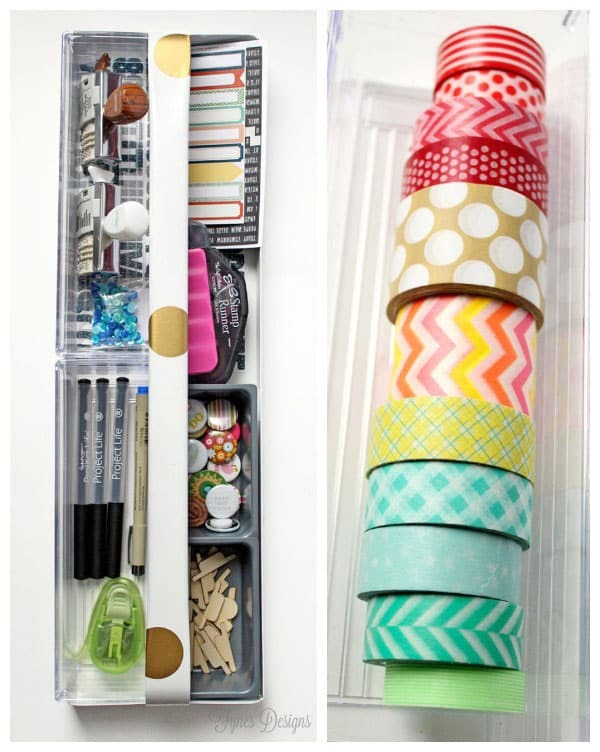 Still needing a bit more crafty organization? Check out my craft room reveal below. 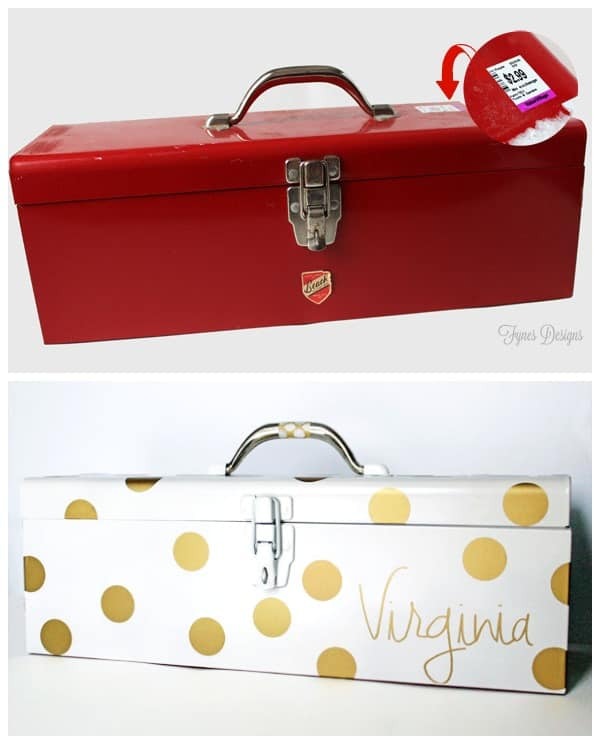 Oh, one more thing… My friend Krista of Happy Housie also refreshed a vintage tool box in a unique way, you should check it out! This is brilliant! I am green with envy at your creativity 🙂 LOVE this! This PL box looks gorgeous! What a simple and pretty makeover…makes me want to run to the hardware store and make my own!! LOVE it!! Thanks Jenny! I super love your style so I’m sure you have loads of fantastic ideas! 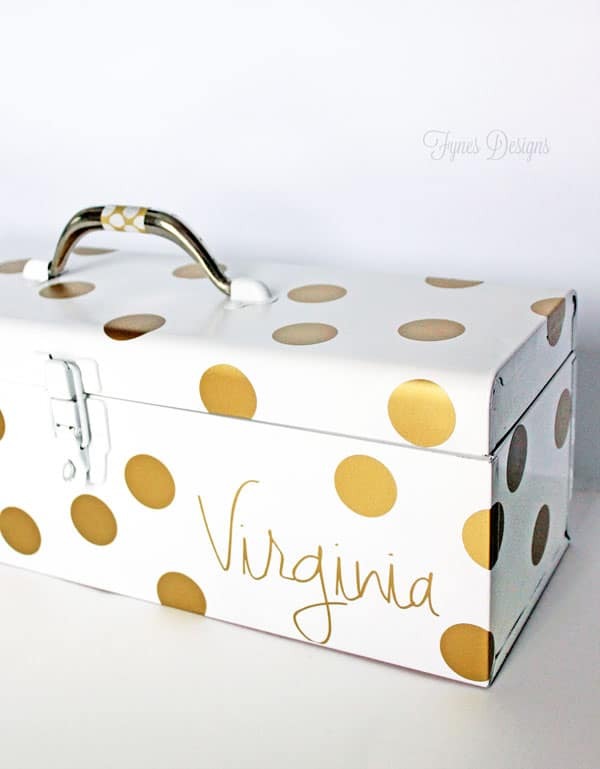 It looks gorgeous Virginia – I love the gold polka dots! $2.99- awesome! 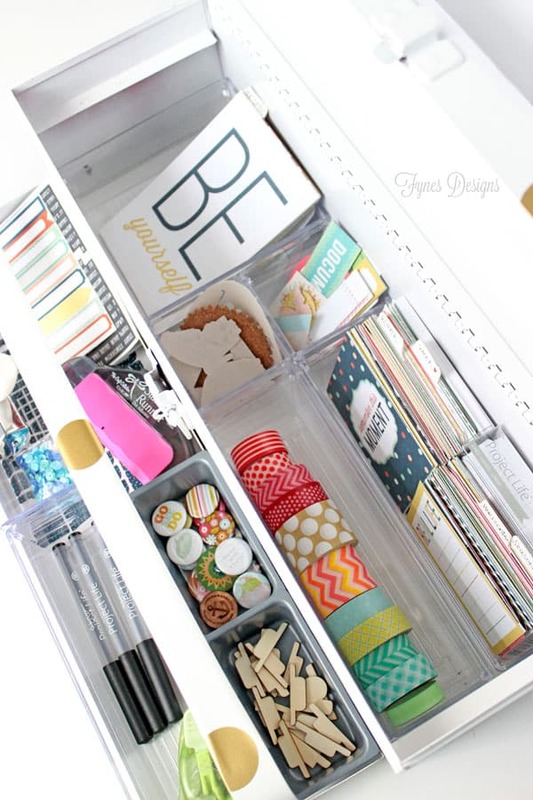 Even the inside looks gorgeous with your beautifully organized supplies. Great project – and thanks for the mention! Pinning this and sharing it on my FB page; have a great day! This is so cute! 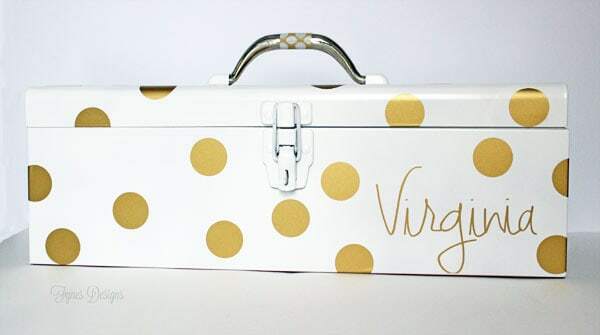 Gold and white is one of my favorite color combinations and I love how you repurposed the toolbox 🙂 Pinning! Stopping by from the Inspiration Gallery link party at DD&D! Thanks so much, I love Gold so much right now, funny how things make circles! This is totally awesome. I love it! What a fantastic idea, now I’ve got to have one too. Looks like you started a trend with this project. You did a wonderful job. I’ve got to read more about Project Life too. I’m now a new follower and a big fan. I LOVE this! What a cleaver, easy and adorable idea! 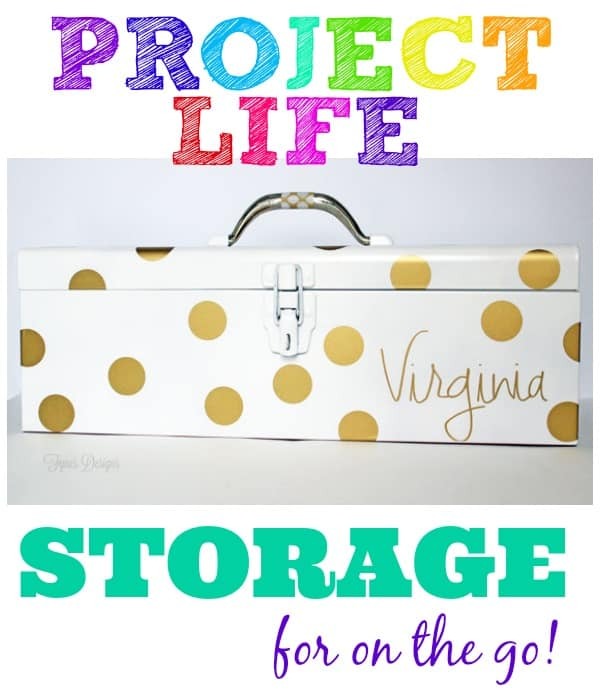 I LOVE your Project Life toolbox Virginia! What a great idea for storing and taking your supplies with you. I am sharing this with my readers! Thanks for sharing your fab project at Inspire Me Monday! Congrats – you are one of my featured guests this week at Create With Joy! I look forward to seeing more of your creative contributions. Have a fabulous week Virginia! This is adorable and your craft room is fantastic!! Very inspiring! I can’t even walk in my craft room right now. It is frightening! Maybe if I make a cute toolbox like this it will snowball into cleaning my room :). Pinning! Thanks Candace! Mine would sometimes scare you too… I can’t lie! I love the tool box make over! I’ve been looking for something rugged to turn into a treasure box for my kids. This looks perfect!